Descendez de votre bateau de croisière et embarquez dans un hydravion pour admirer les lacs bleu vitreux, les cascades et les sommets enneigés du monument national Misty Fjords lors de cette excursion côtière au départ de Ketchikan. Capturez des vues à vol d'oiseau de paysages variés et repérez des aigles, des ours et de nombreux autres animaux sauvages. Mais ce n’est pas tout: votre aventure aérienne, limitée à six personnes par avion, comprend votre atterrissage sur un lac ou un fjord. Faites connaissance avec votre pilote à l'office de tourisme de Ketchikan, en face du port, et montez à bord de votre hydravion à six passagers. Pendant le vol, votre pilote partage les commentaires via votre oreillette, qui offre également une bande son musicale. Empruntez Tongass Narrows, un plan d’eau situé entre Ketchikan et l’île Gravina, et survolez Ketchikan. Admirez la beauté de la forêt nationale de Tongass alors que vous survolez l'île de Revillagigedo jusqu'au monument national de Misty Fjords, à environ 64 km à l'est de la ville. En parcourant une brume basse qui donne son nom à la région, admirez la vue sur les fjords, les falaises et les parois rocheuses qui sortent de l'eau. Les cascades descendent en cascade dans des passages de granit étroits et des forêts denses de pruches et d'épinettes recouvrent les pentes verticales. Votre pilote navigue au-dessus de Rudyard Bay, vous offrant un fantastique point de vue sur New Eddystone Rock, vestige des débuts de l'activité volcanique. Gardez les yeux rivés sur la faune, comme les loups, les ours, les cerfs et les aigles. Ensuite, préparez-vous pendant que votre pilote effectue un atterrissage en douceur mais passionnant sur l'un des fjords ou des lacs (en fonction des conditions météorologiques). Sortez sur un ponton en plein cœur de la nature sauvage et imprégnez-vous du paysage. Votre visite en hydravion se termine par un retour à Ketchikan. Nous veillerons à ce que votre retour au port de Ketchikan ait lieu dans les délais prévus pour cette activité. Dans les rares cas où votre navire partirait, nous organiserons le transport jusqu'au prochain port d'escale. Si votre navire est retardé et que vous ne pouvez pas assister à cette activité, votre argent sera remboursé. Voir nos termes et conditions pour plus de détails. Wonderful trip, the pilot was very good. We enjoyed the float plane ride and knowledge of the pilot but the weather did not permit us to take the typical route thus the experience was somewhat lacking. We did land on the water but other than stand on the pontoon it was not that thrilling. The scenery was beautiful though more misty than the fjord implies. We were unable to complete our tour because of weather conditions. Ketchikan has the highest rainfall for the entire state of Alaska which I was not aware of when I booked but I will say that this is a 'class act' outfit. They were more concerned about our safety than they were about their money, and because the winds got pretty strong as well as the rain, they decided it was not safe to fly. We were VERY disappointed, but they did everything within their power to try to book us on a later excursion that would still allow us to get back to our ship in time for departure, but the rain and winds just didn't cooperate. Our money was fully refunded and put back on our credit care within a couple of days. 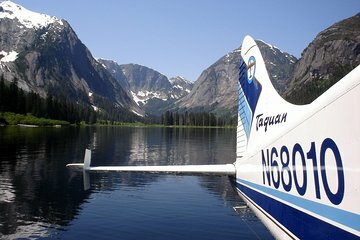 I would DEFINITELY book an excursion with TAQUAN AIR for the Misty Fjords National Monument Floatplane Tours again when in Alaska. This excursion's price was very affordable, and has the same guarantee as the excursions that are booked from the cruise line at about 1/2 the cost. They guarantee if it is their fault that you don't get back to your cruise on time and it's their fault, they get you to the next port. Also, guarantee you will fly or your money is refunded if it's no fault of your own. Should have mics for the passengers. the trip was awesome, scenery was spectacular. landing the plane on one of the fresh water lakes was a highlight. we always felt safe and had full confidence in our great pilot. We loved the flight, the scenery, and the pilot. This was a highlight of our Alaska Cruise. It is expensive, but awesome! Beautiful trip, great pilot. Scenery was spectacular. Didn't happen due to weather. That was unfortunate, except we were not notified and were waiting for pick up at least 30 minutes until we called them. This was one of the highlights of our two-week vacation. We were on an 8-seater seaplane and my husband got to sit in the co-pilot seat and was thrilled. The company was very professional and the pilot was very knowledgeable about the Ketchikan area. We landed on a lake in the middle of the wilderness. Altogether we were in the air about an hour. We booked the tour only two days prior to the excursion date. In the end, we had a difficult time confirming the trip and learning where our exact meet-up place was. Taquan Air never picked up the phone and I ended up having to google them to find another phone number. This was my only complaint. They need to better communicate with Viator or update their information with Viator. Otherwise this was great and cost a lot less than a similar trip offerred by the cruise ship.